1 Early settlers mistakenly surmised that people of the famous Aztec Empire in Mexico created these striking buildings. Archeologists later determined that the builders were ancestors of people of many southwestern tribes. Although the descendants call their ancestors by different names depending on their tribe, they are generally called "ancestral Puebloans." About two thousand years ago nomadic people began to live year round in villages and cultivate crops. They became accomplished farmers, architects, artisans, and traders. They lived across a broad area, including parts of New Mexico, Arizona, Colorado, and Utah. Despite many regional differences in architecture, pottery styles, and other traits, they shared a similar way of life that enabled them to cope with the challenging high desert environment. This settlement represents but a portion of the long history of life in part of this region. 2 Early exploration here focused on this structure, the West Ruin. For centuries, the tops of sandstone walls jutted above a brush-covered mound, hinting at the large building beneath. About 150 yards beyond this structure is another large, unexcavated mound, which is closed to the public. This East Ruin looks much as the West Ruin did before excavation. Archeologist Earl Morris began the first scientific excavation in 1916. He and his crew removed the overburden to reveal this building and thousands of artifacts. About 400 adjacent rooms, rising to three stories in places, enclose a central plaza. A large, round, semi-subterranean building, the Great Kiva, dominates the plaza. Within a mile are scores of other structures, indicating an extensive, planned community. 3 The builders carried sandstone blocks by hand from quarries several miles away. They used stone hammers, mauls, and pecking stones to break and dress the sandstone, which in this area is difficult to fracture into level surfaces. Notice the unusual horizontal bands of green stone, present in just a few other walls in the pueblo. Outer walls were probably plastered with mud, obscuring any decorative stonework beneath, but also shielding the mud mortar from the eroding forces of rain and snow. 4 The north wall of the West Ruin stretches 360 feet, longer than a football field. Most of the structure was built between 1100 and 1130. Its architecture is similar to buildings in Chaco Canyon, fifty miles south of here. Earl Morris recognized a connection between these areas. During the eleventh and early twelfth centuries, Chaco Canyon was the center of a large network of outlying communities. Aztec is one of more than 150 of these communities. Many are connected to Chaco and each other by long straight swales called "roads;" several road segments are near Aztec. These communities and the nature of their relationship to Chaco Canyon are subjects of much archeological research and debate. The Aztec community is certainly related to Chaco, but its size and chronology suggest that it was a center in its own right as Chaco's regional influence waned after 1100. 5 You can trace remnants of the upper walls of an unusual tri-wall structure, one of a handful found in the Southwest. The spaces between three concentric circular walls were partitioned into a series of small rooms, eight in the inner ring, and fourteen in the outer. Most compartments were accessible only by roof hatchways. The central space is called a kiva, and is marked by its own circular wall. Archeologists generally agree it was used ceremonially. Some suggest that the locations of the three tri-walls found at Aztec and their relationship to the many other buildings were important symbols in the "ritual landscape" of the settlement. Maintenance to preserve the exposed and crumbling walls proved too costly here. The site was backfilled to halt its deterioration. 6 This doorway and the next few you will pass through are modern, not original. Pothunters in the 1880s punched holes through these walls, looted the contents within, and destroyed valuable information that might have been revealed to us. 7 These original ceilings have widely spaced spruce, fir, or pine beams set into solid masonry walls that provide support for the next story. These timbers were probably carried from higher elevations at least twenty miles to the north. The overlying aspen poles supported a layer of thin splints of juniper or rush matting. Finally, a heavy deposit of tamped mud topped this layer, forming the floor of the upper story. 8 Imagine how dark these rooms along the north wall of the building were. The small vents set high in the corners and frequently aligned from room to room allowed for limited ventilation and light. Artifacts found included broken pottery, cloth fragments, bone tools, worn fiber sandals, and bits of matting. These rooms were similar to our garages, basements, and closets, where things are stored and discarded but daily activities do not occur. 9 In this room at least a dozen persons were buried. The dead had been carefully prepared with shrouds of feather or cotton cloth; some were wrapped with rush matting. Offerings of pottery, coiled baskets, sandals, sticks, beads, and other items accompanied them. Earl Morris found many burials within these rooms-in shallow pits beneath floors, in trash mounds and storage bins, and in rooms modified into burial chambers. Some rooms contained one individual, but others became a tomb for many. 10 Early researchers likened this building to an apartment house, whose main function was to shelter people. Many today disagree with this analogy. Instead, this building and the community nearby may have been a regional center of ceremonial, administrative, and cultural activity. Residential use, at least in this building's early history, may have been limited to a small caretaker or elite population that was intermittent or seasonal. 11 Across the closed door is an original mat of willows sewn with yucca cord. The inhabitants did not have hinged doors; they used mats, hides, stone slabs, or feather blankets to block drafty doorways. Here, the mat and a framework of small, plastered poles reduced the size of the doorway. 12 For nearly two centuries, inhabitants modified and used rooms in ways that met their needs. During the pueblo's later years, rooms were used for storage, refuse, toilets, work areas and burial chambers - as well as for limited residence. Most of the artifacts that Morris excavated came from this later use. 13 Although this plaza may appear unremarkable, for Earl Morris, it revealed a long sequence of occupation. Digging beneath the plaza, he found buried kivas, some with thick deposits of broken pottery. The pottery designs in the lower, older stratum resembled Chaco Canyon pottery. The pottery in the upper, more recent layers resembled pottery from Mesa Verde, about forty miles northwest of here. Morris believed there were two migrations - the first from the south, the second from the north, with a long period of abandonment in between. More recent studies suggest one dynamic occupation from about 1100 to 1300. As the population fluctuated with climatic change, the major source of influence shifted from Chaco Canyon to the area around Mesa Verde. 14 Large, T-shaped doorways commonly open onto the plaza. Their distinctive shape may have been symbolic and/or functional. This row of rooms parallel to the trail was added later, after the original Chacoan construction. Note the differences in the masonry styles between the inner and outer walls. 15 You have probably noticed several round rooms with special features in them. Similar rooms - called kivas - are used by Pueblo people today for sacred rituals and other special activities. This kiva lies in a portion of the earliest constructed wing of the building. The masonry of carefully shaped stones laid with little mortar, and the low encircling "bench" are similar to Chacoan kivas found in related sites. They were entered by a roof hatch that also allowed smoke from the central hearth to escape. A ventilator shaft worked like a chimney in reverse, drawing in fresh air to feed the fire. A stone slab or low wall placed between the hearth and ventilator shaft deflected the fresh air and reflected heat from the fire. Low pillars that rested on the bench circling the wall supported the roof. Compare this round kiva to the rectangular room on the other side of the trail that was remodeled into a kiva. 16 Look along the upper stories for three doorways that connect rooms at their corners. These are rare and unique to Chacoan architecture. Including them in the structure was risky because they reduce the stability of the walls. The trail continues through a series of rooms in the east wing, and then doubles back to the plaza. 17 Architectural changes due to remodeling over a long occupation and recent preservation work are evident throughout the West Ruin. For example, on the wall to your left the style of masonry abruptly changes, possibly due to repairs made by later occupants. On the opposite wall a vertical line marks a sealed doorway. The National Park Service has stabilized walls to discourage deterioration. Workers backfilled some rooms, replaced eroded mortar and missing stones, rebuilt portions of walls, and treated original wood. Many years of stabilization have altered the architecture and erased many details of prehistoric masonry. Although the building's layout and form have changed little, in many places the masonry and other features of the stabilized walls do not accurately reflect the work of the original builders. 18 The timbers resting upon one another in this kiva demonstrate the lower part of a domed, cribbed roof. A cribbed roof uses many more large timbers than a horizontal roof. Some archeologists believe most Chacoan kivas had flat roofs. 19 There are dozens of great kivas at Chaco, and many others exist throughout the Southwest. This is one of possibly fifteen in the nearby area, an unusually dense concentration of great kivas. A great deal of organization, labor, and materials went into its construction. Most archeologists agree it was a public building, built and used by people of this community and others nearby for ceremonial and other community functions. Earl Morris excavated the Great Kiva in 1921, and then reconstructed it thirteen years later. Morris uncovered remnants of the original building, from which he built this reconstruction. Fifteen surface rooms encircle the central chamber. Their purpose is unclear - Morris found very few artifacts in them. Each had an exterior doorway to the plaza. Morris suspected the presence of the interior doors between the rooms and the center. Although he included them in the reconstruction, they could have been wall niches instead. Four massive pillars of alternating masonry and horizontal poles held up the ceiling beams, which in turn supported an estimated ninety-five ton roof. Each pillar rested on four shaped stone discs, weighing about 355 pounds apiece. These discs are of limestone, which came from mountains at least forty miles away. The colors are based on bits of reddish and white-washed plaster found clinging to the original walls. Charred wood beams on the kiva floor indicated the roof had burned, and also guided Morris in its reconstruction. Most archeologists now think the original roof was lower. The purpose of the large floor vaults on both sides of the central fire box is not certain. They may have been covered with wood planks and used as foot drums. Perhaps they were used for germinating seedlings, as similar features are used in some pueblos today. 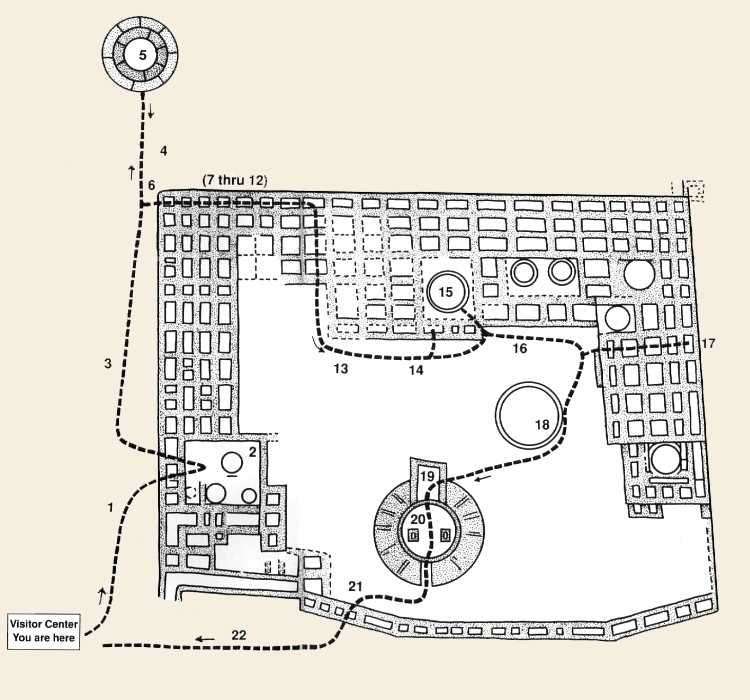 21 This arc of single rooms, common in Chacoan buildings, enclosed the plaza on the south side. Cobbles are plentiful in the area. They were used also for wall foundations. Stabilization has obscured other materials used in these walls, including sandstone blocks and sticks laid horizontally and vertically in copious mud. 22 Archeologists still have many questions about these people. For example, why did they leave? It was common for people to use a building for a generation or two, and then move on. But by 1300 they had departed not only Aztec but the entire Four Corners region. Early archeologists believed invaders drove them from their homeland. This theory lost support as researchers looked more to the environment for an explanation. An extensive drought from 1276 to 1299 affected their lives, although they had endured severe droughts before. Added to drought was an overuse of natural resources. After two hundred years in one place, how productive could their fields be? How much farther did they have to travel to gather firewood, collect building materials, and hunt game? Even with further archeological research, explanations for the people's exodus remain tentative and many questions remain. Researchers may never fully understand the lives of these inhabitants of the Southwest. Archeologists do not know specifically where the people of Aztec went. It is likely they and others in this region moved south and southeast to the Rio Grande Valley, and west where they established and joined thriving settlements. Puebloan descendants live today in the Pueblos of Acoma, Laguna, Zia, Santo Domingo, Hopi, Zuni, and others, where they continue a rich culture influenced by their ancestors. Return to the visitor center to learn more from exhibits and National Park Service rangers.